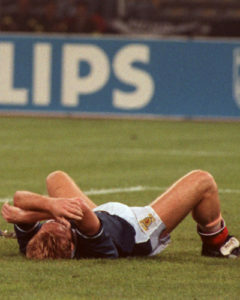 We move on to Italia 90, and a host of Gers players across the Scotland and England squads. SINCE that time they actually won it in 1966 (in case you’ve never heard anyone mention it), this remains the closest any England side has come to once again lifting the World Cup. And which club was the best represented in the Three Lions’ squad? Yep, it was Rangers. The Scottish Champions under Graeme Souness, with no European football ban hanging over them like sides from down south, were able to attract some of the very best talent from England, with their manager Bobby Robson delighted to include them in his squad. From the Light Blues, no less than four players were selected, and they were Terry Butcher, Gary Stevens, Trevor Steven and goalkeeper Chris Woods. 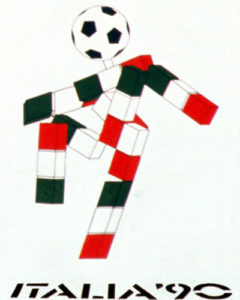 Robson’s side were drawn in a tough Group F alongside the Netherlands, Egypt and the Republic of Ireland, with their three games taking place in Cagliari on the island of Sardinia. Match one was against the Irish, with Stevens lining up at right-back, alongside Butcher, who was in the heart of defence, while Woods was on the bench. 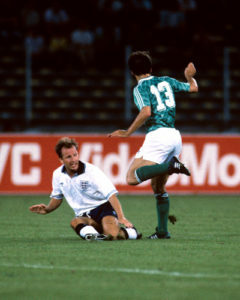 Gary Lineker made it 1-0 to the English after just nine minutes, but Kevin Sheedy shocked them with an equaliser in the second half to end the game as a draw. On then to game two, this time against the Dutch, and Butcher again got the nod in defence, though Stevens had to settle for the bench this time next to Woods. A 0-0 draw there meant all four teams in the group went into the last matchday all level on two points each. England defeated Egypt in that one to top the group, with the unlikely source of Mark Wright grabbing the only goal. A draw in the other match between Holland and the Republic meant England made it through to the Last 16 as group winners. There, they were drawn to face a Belgium side who had finished fourth in Mexico four years earlier, with England knocking them out with a goal in the final minute of extra-time from David Platt for a 1-0 success. Butcher, who by now was wearing the captain’s armband following an injury to Bryan Robson, was the only Gers starter while Woods and Trevor Steven were on the bench. Up next in the quarter-finals were the surprise package of the tournament, Cameroon, who had been inspired by the legendary Roger Milla. Again, Platt opened the scoring for England, but Emmanuel Kunde and Ebelle Ekeke had them on the verge of elimination, forcing Robson into an attacking change as he replaced Butcher with Trevor Steven. With seven minutes to go, England were awarded a penalty for Lineker to convert. Into extra time, Lineker then grabbed another from the spot to send them into their first semi-final in 24 years, where they would face old foes West Germany. Again, Butcher was the only Ger to start, but the trick from the quarter-finals was repeated with Steven replacing him on 70 minutes with the English trailing 1-0. Yet again, it paid off, with Lineker grabbing an equaliser with 10 minutes left to play to send the game into extra-time, and while there were no further goals, the match will always be remembered for one incident involving a future Ranger. Paul Gascoigne, who had an outstanding tournament, was booked in the 99th minute, and that yellow card would rule him out of the final should England make it. It was all too much to take for the then Tottenham man, with his bottom lip quivering and the tears welling up as his error dawned on him. No matter, he continued to contribute, and the game ended goalless requiring a penalty shootout. it’s become the stuff of nightmares for England over the years, mostly stemming from this match, with Chris Waddle and Stuart Pearce the unlucky ones to miss for England as the dream died a painful death. Both Gary Stevens and Trevor Steven played in the bronze medal match – but that yielded nothing too, with Italy ending their own tournament on something of a high with a 2-1 win. England had, however, restored some serious pride and credibility to themselves as a footballing nation after a tough period for a variety of reasons, while they had fallen in love with the maverick but world-class Paul Gascoigne. WITH four players in the England squad, a further three Rangers made the Scotland squad for their fifth World Cup on the bounce as they looked to finally make it out of the Group Stage for the first time. Drawn against Brazil, Sweden and the unknown Costa Rica, again, the top two were guaranteed to progress while third place would be good enough for four of the six teams in that position. Manager Andy Roxburgh called-up defender Richard Gough from Ibrox, alongside the potent striking duo of Maurice Johnston and Ally McCoist, with the former two lining up in Genoa for the first game against Costa Rica. Gough, who had been suffering from an injury in the build-up to the match, had to be withdrawn at half-time with the score level at 0-0, while Johnston missed a number of chances to have his side ahead. Both of those negatives were to cost Scotland, with Juan Cayasso grabbing a winner to shock the Scots and heap massive pressure onto them for their second match against an impressive Sweden side. This time, Scotland were excellent, with future Gers midfielder and manager Stuart McCall opening the scoring after 11 minutes. Johnston then grabbed a second from the spot before the Swedes pulled one back. And so to the last game then against the mighty Brazil. Roxburgh opted to field both Johnston and McCoist up front together, and again Scotland turned in a decent show, and were unlucky to lose 1-0 to a Muller goal just nine minutes from time. Anything other than defeat that day would have seen them through as one of the best third-place sides, and indeed, two points may well have been enough, but a 1-0 win for Uruguay over South Korea in their final Group E match saw them be the ones to once again deny Scotland progression.